Convert PDF to fax compatible TIFF. Extract image from PDF and save to TIFF. 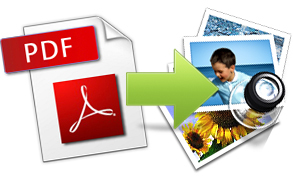 If you want to extract images in PDF files and save them as image files like TIFF, you are going to need a professional converter like PDF to Image Converter, PDF to Image Converter COM, PDF to TIFF Extractor, and PDF to TIFF Extractor COM. Supported by Windows 98/ME/NT/2000/XP/2003/Vista/7 of 32-bit and 64-bit. PDF to Image Converter has the capacity to convert PDF files to various image formats, such as TIF, TIFF, BMP, PNG, EMF, GIF, JPG, JPEG, PCX, and TGA. 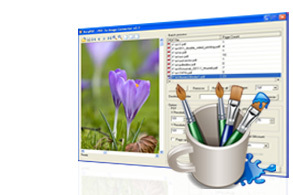 It can also convert a whole PDF page to an image file including text, line, color, arc, ellipse, image, Bezier, form, etc. 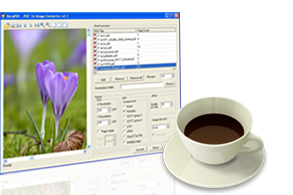 Support various target image formats: TIF (TIFF), JPG, GIF, PNG, BMP, WMF, EMF, PCX, TGA, etc. Support PACKBITS, CCITT Fax4/Fax3, LZW, Run-Length, JPEG, JBIG2, JPEG2000, FlateDecode compression technologies. Convert PDF to searchable vector EMF and WMF images. Convert PDF to fax compatible Class F TIFF. Specify resolution for generated images. Specify color depth for created images. Specify range of pages to convert. Option to select algorithm compression for image. Preview PDF in the preview frame before conversion. Support converting password protected PDF. Convert owner password protected PDF directly. Smart for processing large PDF. No need for any third-party PDF reader software. 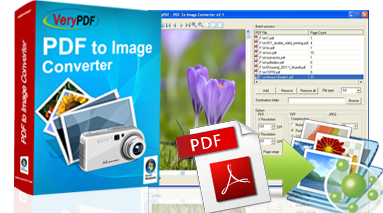 PDF to Image Converter COM is for server runners to implement the same functions of PDF to Image Converter on their servers. This COM package provides some examples in C++, ASP and VB.